It’s been a busy week but here are a couple of progress shots to keep you in the loop! Step Seven: Colour wash. As you can see by the photo I decided to paint all but the sky a warm cadmium yellow. Again, I choose to use acrylic paint for this step because it dries quickly. I like to add a wash because it seals in the graphite, which if painted on directly would contaminate the oil colour by making it grayish…so very frustrating! Step Eight: Paint. Painting the background first is always a sound choice when it comes to landscapes. Why? 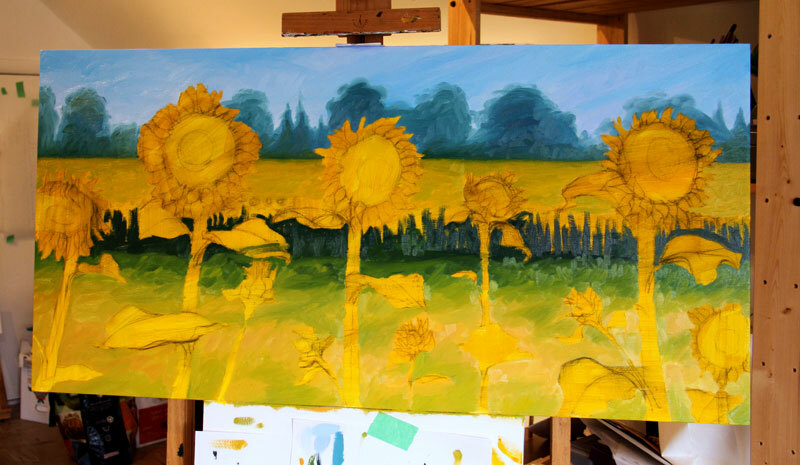 My reason is that it’s much easier to paint over the background than to paint around the foreground (large sunflowers). If I did finalize the foreground I would have to be very precise whilst painting around them and all the while slowly going mad! The background isn’t completed at the moment but hopefully in my second painting session it will get closer to being done. More than likely I will add the finishing touches after I’ve completed the foreground flowers. 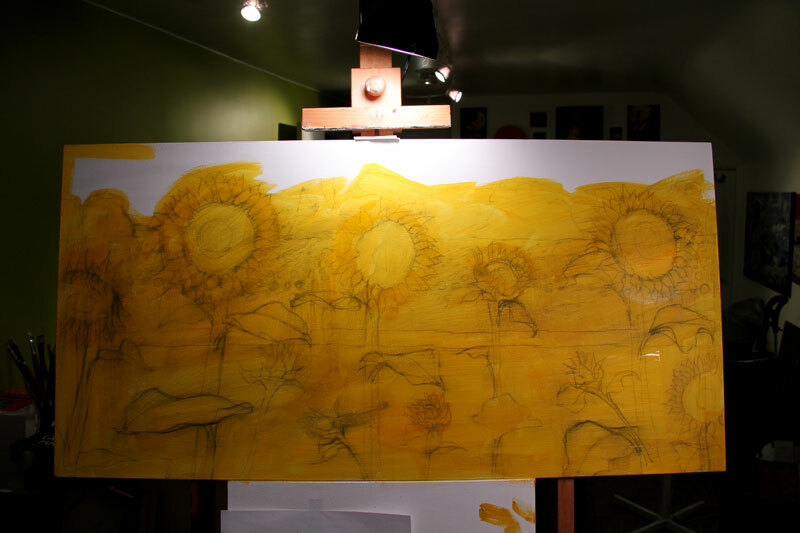 My next step will be working on the field flowers and creating an interesting but convincing pattern of green through the blanket of sunflowers. Again, I do not have one reference photo that I am working from, so all of this is about piecing together elements that work with the current design.